March Madness always seems to go faster than I remember...how are we already down to the Sweet 16? More urgently, how is it already nearing the end of March?? To be completely honest, we like to make any and every excuse to make food to go with every occasion. So naturally when we heard "sweet 16," our first thought was, "Well guess that means we're making something sweet!" Black garlic is the perfect ingredient to go with your dessert. I know it sounds weird...bet you never thought you'd eat garlic in a dessert! But this unique ingredient gives anything chocolatey a little extra kick, and will make unsuspecting consumers stop and think "What is it about this chocolate that makes it a little bit different?" 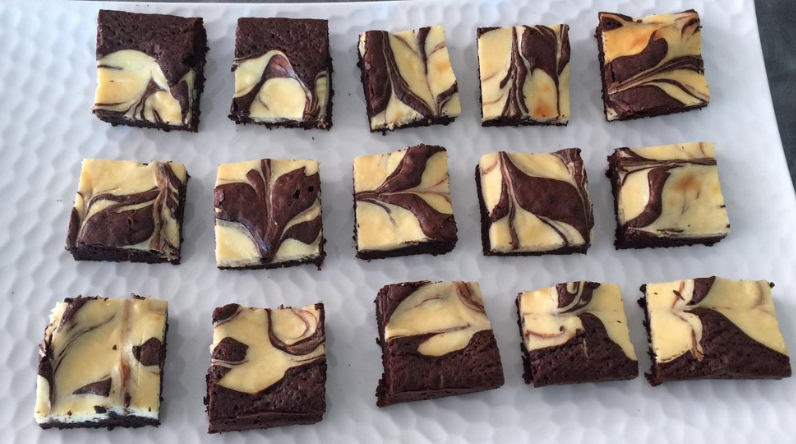 This recipe for Black Garlic-Dark Chocolate and Vanilla Bean-White Chocolate Marble Brownies (that's a mouthful right?) is rich, decadent, and will give your Sweet 16 watch party something to think about besides the game. We can't be held responsible for any distractions. Enjoy! Preheat an oven to 350˚F and lightly spray a 9 inch x 13 inch baking pan with neutral flavored oil. Line the pan with a sheet of parchment paper that overhangs the edges by 2 inches (the spray will help it stick to the pan). Chop the white chocolate into 1/4 inch pieces and place in a medium sized microwaveable bowl. Add the butter and microwave for 30 seconds. Stir and microwave again for 30 seconds. Take the bowl out and stir until all the white chocolate is melted. White chocolate scorches easily so be careful. You can also use a double boiler to melt the white chocolate. Once the white chocolate is melted, stir in the white sugar until incorporated. Add the eggs one at a time, beating with a fork until incorporated. Add the flour, baking powder, salt and beat until incorporated. Split the vanilla bean lengthwise and scrape the seeds into batter, reserving the vanilla pod for another purpose. Add the vanilla extract as well and stir to incorporate. Set aside while you make the dark chocolate batter. Chop the dark chocolate into 1/4 inch pieces and place in a medium sized microwaveable bowl. Add the butter and microwave for 30 seconds. Stir and microwave one more time for 30 seconds. Stir until all the chocolate is melted. If you have any stubborn pieces that won’t melt after stirring, place it back in the microwave for 15 seconds more. You can also use a double boiler to melt the dark chocolate. Once the dark chocolate is melted, stir in the brown sugar until incorporated. Add the eggs one at a time, beating with a fork until incorporated. Add the flour, baking powder, salt and beat until incorporated. Take the head of black garlic and cut the top off with a sharp knife. Remove the cloves of black garlic from its skin, and place in a small bowl or onto a cutting board. Mash the black garlic until it is a paste and beat it into the dark chocolate batter. Spoon the white chocolate and dark chocolate batter into the prepared pan, alternating spoonfuls. Using a butter knife, swirl the batter around to marble them together. Don’t over-mix, you want the batter to be marbled not blended. Place in oven and bake for 25 to 30 minutes, or until a toothpick inserted into the middle of the pan comes out clean and the edges of the pan start to look golden brown. Cool in the pan and then remove by grasping the parchment paper by its sides and lifting the brownies straight up.